Here come the holidays with all of the accompanying joy of giving. Also, arriving is the planning, spending, budgeting, and finding time to complete your holiday agenda. When I was offered the opportunity for a free trial at FreeShipping.com, I jumped at the chance. This post is sponsored by FreeShipping.com, however, all opinions are 100% mine. How would you want to spend an extra cash back on this year’s holiday spending? FreeShipping.com is offering cash back, and awesome deals you can find at each of your favorite stores. I recently discovered FreeShipping.com and let me tell you why I love it and why I think you will too! Cash Back is Automatic: Users shop through the portal, and cash back amounts are banked automatically. You’ll receive a check quarterly (your holiday shopping check will appear mid-January). 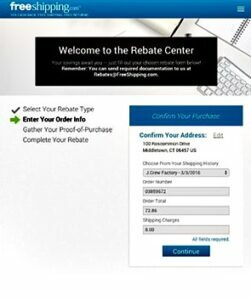 Shipping: If users ever have to pay a shipping charge, just log into your FreeShipping.com account and fill out a simple rebate form to submit your claim. 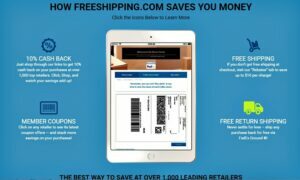 FreeShipping.com covers up to $10 for every shipping claim and members can make a claim at over 1,700 retailers. You’ll get a check within 4 weeks. Unlimited Return Labels: If you need to return something, simply print out FedEx Ground® labels through the FreeShipping.com site, and your return shipping is free. 10% cash back all year long! You don’t have to wait for special cash back promotions. Get a 7-day free trial – NOW is the perfect time to give the site a try! You already know me as a frugal shopper. It is a given that my like-minded readers would hate to pay for shipping, but up until now, return shipping was something we had to accept. If we bought something that didn’t work out, we would have to pay for return shipping or schlep it back to the store to avoid that fee. Well, no more… Now we can score online deals to our hearts content and just print out a return label at the FreeShipping.com site and send it back and return shipping is free. Woo-hoo! I haven’t mentioned this before, but I have some big family news. Next year, both of my children are getting married. We are so excited and feel very blessed but yikes! I have a lot of shopping to do. Right now, being a frugalista, I am shopping for a holiday party dress that can also double as a Mother of the Groom dress for my son’s wedding in March. I’ve been on the Macy’s site and I am seeing several choices that I think could work. I have no time to go to Macy’s in the next few weeks and try on dresses. Now thanks to FreeShipping.com, I can order a few of them to try and send back the ones that do not work out. I’m sure I can find the perfect dress and not have to worry about shipping minimums or returning dresses back to the store. Just type the name of the store in the search bar at the FreeShipping.com Holiday page and then see coupons you can use right now on your order. Search by topic too! I went to the FreeShipping.com Holiday page searched for Macy’s and then Mother of the Bride dresses and now I have all these choices. What a time saver, and a money-saver, wow! Stay tuned for pictures! My daughter is getting married in August so I have a little time to catch my breath before that wedding. I want to enjoy this special holiday season with my expanding family. I really do love the hustle and bustle of the holiday season, even though I always feel a little overwhelmed. My husband, on the other hand, does not enjoy shopping at all, but his business requires gift giving to clients when the need arises throughout the year. 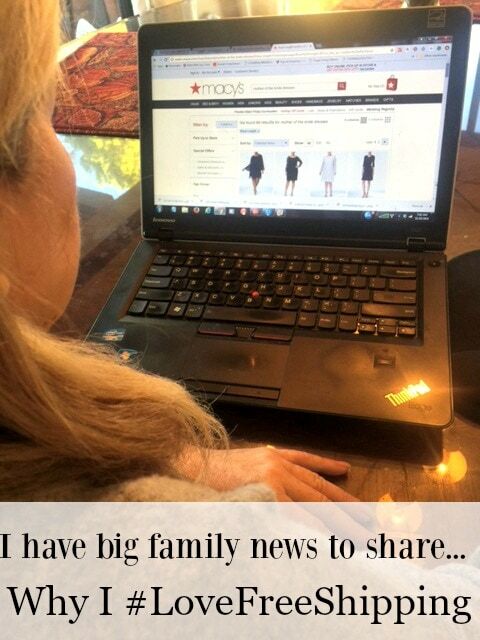 Now he can order what he wants online without having to worry about shipping minimums and added fees. The site is very easy to use. Now there is no need to wait for a free shipping holiday. Enjoy free shipping every day of the year. I have been using cash back sites for several years and always appreciate receiving those quarterly rebate checks in the mail. I had no idea that FreeShipping.com offers 10% back! At more than the 1000+ participating stores, there is a 10% cash back feature which can result is substantial savings with your online purchases during the holiday season. The list includes Walmart, Bath&Body Works, Kohl’s, Macy’s, BestBuy, Sears, and many more of our favorite stores. 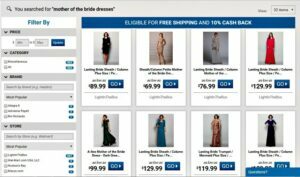 FreeShipping.com has all of the deals in one place. 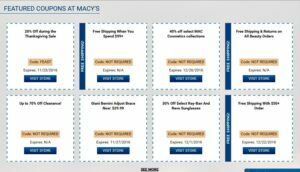 You will even find exclusive retailer coupons that can add even more savings to all of your online purchases right at check out. FreeShipping.com will save you time and money and isn’t that two things we could all use, especially now! Find the best holiday deals here in their special Deals section. Get your free 7-day trial today and make things so much easier. Enjoy your holiday and stay tuned for lots of wedding talk. I’m going to be a mother-in-law! 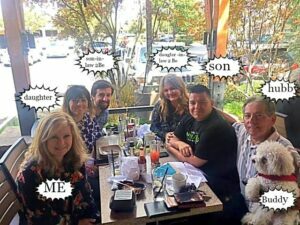 How Would You Like to Win a $500 Visa Card? Enter the easy giveaway and good luck, I hope you win! Wow I have never heard of this! I would love free shipping on everything and this site seems perfect for me. Thanks for sharing! With 20% cash back, I would definitely go out and spoil my family with their favorite holiday gifts. With 20% cash back, I would get a new pair of Boots! I need boots for this cold holidays! Free shipping,cash back I could buy somethings that I need for myself always have to do for kids first. How have I never heard of this site before? I think I would finally bite the bullet and buy the roomba I’ve had my eye on. I would use the 20% savings to buy my mom an extra gift…like lots of new nail polishes. I would finally get a laptop. I would love the 20% savings to spend on Christmas! Wow! 20% back is a huge cash back program. I would use the rebate to buy a new bread machine.